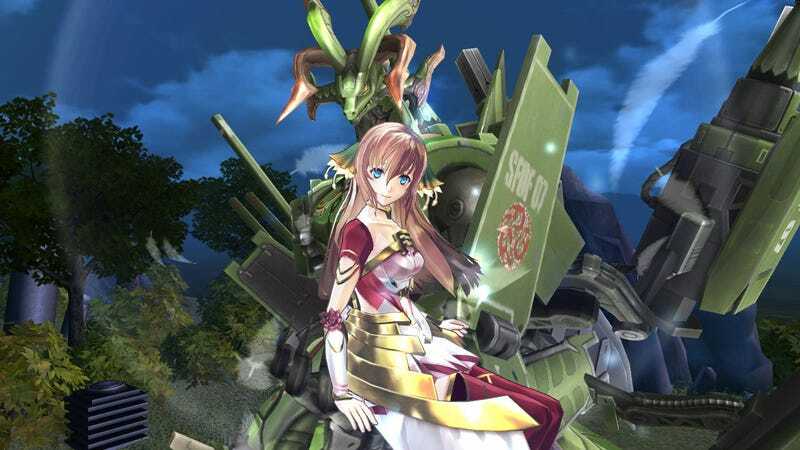 Today Tecmo Koei announced that Gust's Ar Nosurge: Ode to an Unborn Star, a prequel to the amazing Ar Tonelico series, is coming to North American PlayStation 3 consoles on September 23. Games like this are the reason my PS3 is the only console hooked up right now. Ar Nosurge: Ode to an Unborn Star is a turn-based science fiction role-playing game which tells the story of a lost civilization roaming the edge of the galaxy, searching for a new home. Players follow the adventures of two sets of adventurers — Delta and Casty, whose goal is to protect humanity, and Ion and Earthes, who just want to get home. As in the Ar Tonelico series, music is magic in this universe, so strong player characters protect their group's singers as they build up and unleash powerful attacks and summonings. The relationship between player characters will be explored, psyches will be investigated, visual novel style, and sexual innuendo will be laid on thick. The announcement of the game's impending release in the U.S. and Europe punctuates my favorite period of a PlayStation console's lifespan — the end bits, as less big budget games make the grade, paving the way for quirky goodness. Last week I was flooded out of my old apartment. So far the only console I have hooked up is the PlayStation 3, where I'm playing Project Diva F and Atelier Rorona Plus. I wonder if I can make it to September without plugging in anything else.